We’d love your help. Let us know what’s wrong with this preview of A Thousand Suns by Alex Scarrow. To ask other readers questions about A Thousand Suns, please sign up. This book is a fantastic debut Novel for Alex, I myself am a fan of many genre, and in the world of War time exploits one of My favourite authors is Jack Higgins, some one I consider the master of this genre. I would put this book up there with his best, against the likes of Cold Harbour and The Eagle Has landed. The Story Is a great testament to the courage or the men who fought in those times, alot of people forget or don't know that the Germans had many Brave men who were not Nazis and hated the Nazi ideal, but at the same time were committed to Germany and her people. They fought under the same appalling conditions with a great deal of courage and conviction...there are 2 side to every tale and this Story Shows the courage of the men from both sides and the hard decisions they might have had to make. The story has a nice pace to the action, flitting between past and present without confusing the reader, and embroils you in web of secrecy that might have surrounded such an event if it had truly happened with its excellent easy to like characters. Its a shame that this book is clearly a 1 off as I would really have like to meet some of these characters again. Keep up the good work Alex, and I hope you write another wartime novel soon as you have a great flair for it. Another one of those Tesco bargains and another surprisingly good little book. Historical military fiction again... also with the possibility of alternate historical outcomes too. This book is not complex, yet has sufficient in it to satisfy thriller fans as well as military fiction fans. A real fast paced thriller in the style of Dan Brown, set during the final days of WW2. A great read, not too heavy, violent or deep. This review has been hidden because it contains spoilers. To view it, click here. The premise of this book is interesting – in the dying days of World War II, Hitler authorises a desperate mission to turn the tide of the war by dropping an atom bomb on Manhattan. By demonstrating the Germans' might at this last minute, the US would have no choice but to surrender and join them in turning back the Russians, who are rapidly advancing on Berlin. We see the ill-fated mission unfold from a number of different, and mostly German, perspectives. In fact, in this long-winded and padded The premise of this book is interesting – in the dying days of World War II, Hitler authorises a desperate mission to turn the tide of the war by dropping an atom bomb on Manhattan. By demonstrating the Germans' might at this last minute, the US would have no choice but to surrender and join them in turning back the Russians, who are rapidly advancing on Berlin. We see the ill-fated mission unfold from a number of different, and mostly German, perspectives. In fact, in this long-winded and padded novel, there are probably a few too many perspectives, as I occasionally had trouble keeping track of who was who. But the thing that really killed it for me was the structure. Not content to simply have an interesting story with remarkably complex and likeable German characters, Scarrow felt the need to intertwine a bit of a hokey present day mystery, as a British photo-journalist living in the US stumbles onto the doomed plane, now resting at the bottom of the North Atlantic Ocean. The problem is that by doing so, he’s completely sucked the suspense out the story, as its clear the mission failed. Add in a covert government department tasked with covering up the entire event at any cost, and it’s all a bit much, really. I kind of just wanted Scarrow to pick one aspect of the story and go with it – he’d have been on to a winner, I reckon. This was an exciting read that kept going right to the very end. It kept jumping from the present day to the past to tell the story but spent more time in the past. Maybe just a little too long. Some of the fine detail could have been cut without harming the overall story. Enjoyable but not worthy of a second read! I think Alex Scarrow is an author who writes good stories. I have enjoyed other stories written by him. An interesting premise ruined by the fact that the final result is known by the end of the first chapter. If you're going to write a 'what if' novel then you will probably know that real life produced a different result but there might be a good 'what if' story to it. All well and good if the plot isn't given away in the first few pages. Also, it's at least 100 pages too long for the story. A good alternative fiction, It might have happen but we will never know. I was gripped by this despite knowing what happens to some of the characters. My first bit of holiday reading during my recent trip to Malta! This is the best Alex Scarrow novel I've read, but it's still not very good. During the dying days of WW2, the Germans launch an audacious mission to drop a bomb on Manhattan, in an effort to turn the Americans against the Russians. It's politically unsound and, of course, doomed to failure. The problem is that we KNOW it's doomed to failure because the novel begins in modern times, with an annoying, colourless British photo-journali My first bit of holiday reading during my recent trip to Malta! This is the best Alex Scarrow novel I've read, but it's still not very good. During the dying days of WW2, the Germans launch an audacious mission to drop a bomb on Manhattan, in an effort to turn the Americans against the Russians. It's politically unsound and, of course, doomed to failure. The problem is that we KNOW it's doomed to failure because the novel begins in modern times, with an annoying, colourless British photo-journalist investigating the discovery of a downed WW2 plane off the coast of Maine. So there are two intertwined plots: the German pilot and his friends on their mission - which we know will fail, and we know will end up with them in the sea off the coast of Maine - and the Brit investigating and running into a top-secret US government department determined to keep a secret AT ANY COST. German B (thinking): Alpine troops?! Why?! German C: "Snow soldiers? Mein gott, achtung, eins, zwei, drei, danke." There are also a couple of hilariously dumb moments that got past the copy editor, like when one character is ON Rhode Island (does Scarrow think it's an actual island?) or when a government department set up to cover up the JFK assassination gets wound down "thirty years later", in the mid-1980s. Even I can count better than that (though not in German). Most stupidly of all, the plot hinges on a government department that went around killing people, including children, to keep a secret, but left the evidence of a downed plane at sea in a FISHING COMMUNITY. How could anything go wrong?! Like thousand suns. As such, in my view, shines this war novel from Alex Scarrow. The book has two story-lines; first from the end of the war in 1945, which tells the story of the bomber's crew; the second from the present, where a journalist with his friend a diving instructor head off to explore the found wreck. Some might be put off for from the very beginning it's clear how the crew ends. However, it's not so. Within a while the book will devour you and won't go until the end. As was said the Like thousand suns. As such, in my view, shines this war novel from Alex Scarrow. The book has two story-lines; first from the end of the war in 1945, which tells the story of the bomber's crew; the second from the present, where a journalist with his friend a diving instructor head off to explore the found wreck. Some might be put off for from the very beginning it's clear how the crew ends. However, it's not so. Within a while the book will devour you and won't go until the end. As was said the story is highly addictive. Even thou it's clear how the crew ends, it doesn't mean that there is no surprise for you between the beginning and end. And of course there is the story of our journalist. What else is important here is that the jumps between the past and present do not confuse the reader. Everything is given so that sooner or later we get the answer to everything. Another important is the characters. There're quite a few here, but it's impossible to get lost in them. What else deserves praise is how they have been drawn out. Especially the main characters so you think you know them personally. And I must say I quite pitied the crew. The right will to fight for their country a people, however, not exactly with the right means. And of course there is still the other side from the present, which for 60 years has been trying to maintain the secret a secret, but again with not the best means. Everyone will find here someone whom he'll like or hate. I really enjoyed A Thousand Suns. It's hard to believe it's a debut novel as the plotting is very assured and mature. This is the parallel story of a last ditch effort by Germany to win the war in its last weeks interspersed with the contemporary story of the discover of a B-17 bomber sunk in shallow water off the coast of Rhode Island. Except the pilot of the bomber is clearly wearing Luftwaffe clothing! I found the past story utterly compelling and entertaining. Initially in the background, it c I really enjoyed A Thousand Suns. It's hard to believe it's a debut novel as the plotting is very assured and mature. I found the past story utterly compelling and entertaining. Initially in the background, it comes to the forefront as the book progresses. I found the contemporary story to be interesting, although a skeptical reader may have one or two quibbles about the coverup's credibility. The characters, particularly the WWII ones, are very well drawn. The plot is a clever idea at its worst point and brilliant at its best. For someone who had mostly written video games before, the author can write with authority and commanding detail about the past. I'm amazed this is a first book for the author. He has immense confidence during most of it. When my brother explained to me what this book was about, I was very curious and created high expectations towards this novel. Unfortunatly, it didnt match my expectations, since I found some things to be a bit bothering. Firstly, the way the story is told in my opinion is not the best, since the reader knows almost from the start how the end is. When my brother explained to me what this book was about, I was very curious and created high expectations towards this novel. Unfortunatly, it didn´t match my expectations, since I found some things to be a bit bothering. Secondly, I think the autor just "casted" a lot of characters. Too many, in my opinion, since some of them don't matter that much to the action. Like naming characters that only appear in a single chapter, and implying that maybe latter they will be important again. There are some loose ends, when it comes to historical acuracy, but because this book deals with alternative history and the element "what if.." , i was able cope with it. Not everything is negative, so there are some "surprises" in relative extent, as the novel unfolds. It was a pleasent reading, but it was not what I was expecting, but it doesn't mean i didn´t had a bit of fun reading the book. This review has been hidden because it contains spoilers. To view it, click here. ok I have marked this up as containing spoilers but I don't really want to pass anything away just that its difficult to comment without give some sort of hint. Right the book - its a strange one - even though the write up and cover comments do not mention it - you do not have to be a rocket scientist to figure out what they are referring to. Now here is the surprise - you can sort of guess what happens or does not - and you know the eventual fates of the characters ok well most of them at least ok I have marked this up as containing spoilers but I don't really want to pass anything away just that its difficult to comment without give some sort of hint. Right the book - its a strange one - even though the write up and cover comments do not mention it - you do not have to be a rocket scientist to figure out what they are referring to. Now here is the surprise - you can sort of guess what happens or does not - and you know the eventual fates of the characters ok well most of them at least (there is a nice little twist) but rather than tell in short clips the original story while focusing on the modern events - it happens in reverse with the main story telling the events leading up to those that open the book. This review has been hidden because it contains spoilers. To view it, click here. I found myself absolutely absorbed by this book, despite it being an unusual choice for me. The pace of the story kept me interested and the descriptive battles provided enough information for my imagination to do the rest. Although the leading characters were from 'an historical enemy' and their mission was to be a devasting one, I found myself drawn to them as individuals and sympathetic to their experiences and dilemmas. Other reviews have critised the ending - suggesting that Chris should no I found myself absolutely absorbed by this book, despite it being an unusual choice for me. The pace of the story kept me interested and the descriptive battles provided enough information for my imagination to do the rest. Although the leading characters were from 'an historical enemy' and their mission was to be a devasting one, I found myself drawn to them as individuals and sympathetic to their experiences and dilemmas. Other reviews have critised the ending - suggesting that Chris should not walk away. But for me, it was the right ending and the implication is that Chris will tell the story in another way....and one that would probably be more easy to hear and cause more open discussion. 1 star - binned it before half way, please don't write anymore!!! 5 stars - want more, more books, more movies about the books, more movies about the authors and the making of t 1 star - binned it before half way, please don't write anymore!!! A fairly gripping "what if" World War Two novel. The "what if" the Nazis did develop the atomic bomb and "what if" they plotted to send a captured Boeing B-17 bomber straight at New York City in the dying moments of the war in Europe? The novel is structured in two interwoven parts: a contemporary story of a search for the truth about this last-gasp operation; and an account of the planning and execution of the flight from the German perspective. 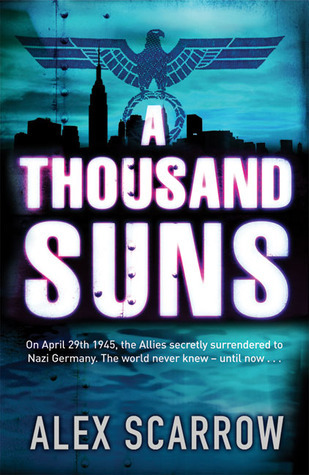 Scarrow used to design video games and this exper A fairly gripping "what if" World War Two novel. The "what if" the Nazis did develop the atomic bomb and "what if" they plotted to send a captured Boeing B-17 bomber straight at New York City in the dying moments of the war in Europe? The novel is structured in two interwoven parts: a contemporary story of a search for the truth about this last-gasp operation; and an account of the planning and execution of the flight from the German perspective. Scarrow used to design video games and this experience serves him well in structuring the tale. An alt.history WW2 story that I quite enjoyed a smidge more than an average 3 stars I reckon. Straightforward enough, it's a little like the "5 hours earlier" plot device in movies and television shows; you know where things end up but not exactly how. And that forms the meat of the story as a few characters push this onward. Not brilliant, not essential, a little different from my norm, but pulpy and enjoyable enough. 4 stars seems generous, so call it 3.5/5. 'On April 29th, 1945, the allies unconditionally surrendered to Nazi Germany. Four hours later that surrender was withdrawn...'[return][return]It was the above tagline that made me pick up the book, and it was such a good purchase. It had been a long time since I was unable to put a book down until I'd finished it, but had to do it in this case. Absolutely brilliant idea, really well executed. Thoroughly recommended. I got halfway through the book and realised that I didn't actually need to read any more. The ending was clear because it's one of those books that is set in two dates, so I knew what was going to happen. A quick flick to the end and I realised that I was right; nothing unexpected did happen; so i saved myself a few hours then. It's a fun setting, and has some research which did like. But dramatic irony does nothing for me; so that was that really. I listened to this book as an audio and enjoyed it. The story is well crafted and nicely read by Robert Slade. The story flashes back to the last days of World War II and Germany's last ditch attempt to secure victory from the Allies and prevent complete annihilation from the Russian army. It is an actioned filled story with a solidness about it. I was able to relate to many of the characters in the book. This is a fun book. It starts out with a WWII mystery and then spends quite a bit of time telling the WWII story while jumping to the current time characters. What if Nazi Germany had developed the A Bomb before America? What if they had used that to try to blackmail the US? What if the Germans tried to deliver the bomb to NY via a captured B-17? All of this is explored in this book. It is an entrancing piece of fiction. Fiquei muito desapontado! Esperava muito mais! Não recomendo este livro! I really liked it. Probably came to a too quick an ending. But then again I say that with all the books that I enjoy. Probably because I don't want them to end. But saying that, I can understand the German side of the tale finishing as it did, but I would have liked Chris and Mark to have done more towards the end rather than just give up and walk out. This was a great idea, good book and definitely one that I would read again. There were a couple of sections that had me scratching my head but in all I really enjoyed reading this book. Alex Scarrow has definitely joined my list if favourite authors. Although the books premise was very good, to say I enjoyed it throughout would be a lie. A great novel, but one that can be very boring. The end of the book, however, was very good. Bur the middle was kind of boring.